The story goes on to suggest the sites were an attempt meant to trick people into thinking they were going to be visiting conservative think tank sites like the Hudson Institute, but instead were redirected to pages created by the hackers in order to steal passwords and other credentials. These attacks are seeking to disrupt and divide,” he said. “There is an asymmetric risk here for democratic societies. The kind of attacks we see from authoritarian regimes are seeking to fracture and splinter groups in our society. But enough depressing security news…what new gadgets are coming out and how much do they cost? Apple is rumored to be developing a pro-focused upgrade to the Mac mini and a MacBook Air reboot that will have smaller bezels and a retina 13” screen later this year. This according to a report from Bloomberg. Bloomberg suggests the new laptop will look similar to the current MacBook Air and will remain about 13 inches. No word on cost. Me, my 2011 vintage MacBook Air still works just fine, thank you very much. At last count, Slack had 8 million daily active users and over 70K paid teams, and only just three years ago was valued just above that of your standard, everyday Silicon Valley unicorn (just north of $1B). Maybe they need a new term for those unicorns who graduate to +$5B valuations. Unicornaminotaur? Oh, yes, Wednesday. Hump day. I’ve been so busy this week on back-to-back phone calls that I’ve hardly had an opportunity to lift my head and see what’s going on in the world. I finally took a few moments this morning to do so, and discovered a couple of tidbits on the mobile front. One, the new Samsung Galaxy IV is now available, and two, the QWERTY keyboard version of the new BlackBerry, the Q10, is also available. On the former, it’s a mixed bag according to the Verge, though a mostly positive bag but one that suggests Samsung Galaxy has plenty of “good enough” competition not to warrant the steeper price of entry for the IV. And on the latter, TechCrunch writes the Q10 is “a QWERTY keyboard smartphone comeback worth waiting for,” which I’ll consider at least a semi-positive endorsement. Me, I’m sticking with my LG Cosmos 2 feature phone. The other is, I like having a phone that works as a phone. I have an HTC Android device, a Kindle, an iPod Touch 5th gen, an iPod Touch 2nd gen, and an iPad 1st gen for all my tablet needs. But for all the time I spend on the phone, good battery life and strong signal reception are key, and the Cosmos 2 continues to deliver day after day without fail. “Can you hear me now?” are words rarely spoken through the Cosmos. Speaking of the cosmos, in the social media realm IBM just announced that for the fourth consecutive year that IDC ranked them number one in worldwide market share for enterprise social software. 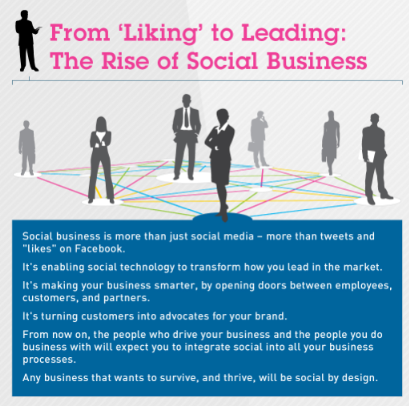 Fact is, social networking adoption continues to soar as businesses look to transform their organization into a smarter enterprise that is capable of empowering a global workforce and transforming client experiences. According to IDC, the worldwide enterprise social market segment reached 1.0 billion in 2012, representing growth of 25 percent over 2011. IBM’s social business software and services pair powerful social networking capabilities with analytics that help companies engage all key stakeholders whether an employee, customer or partners in order to accelerate innovation and deliver results. Today, more than 60 percent of Fortune 100 companies have licensed IBM’s solutions for social business, including eight of the top 10 retailers and banks. IBM’s social networking platform, IBM Connections, allows for instant collaboration with one simple click and the ability to build social communities both inside and outside the organization. 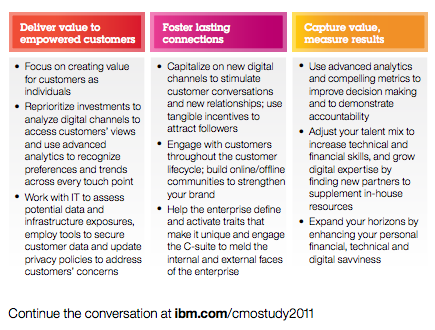 We live by it inside IBM these days, and it’s available both on premise and in the IBM SmartCloud for Social Business. IBM currently has three IBM SmartCloud for Social Business facilities based in North America, Europe and Asia Pacific. You can learn more about the latest version of IBM Connections in the video below. At IBM Connect 2013 in Orlando, Florida, IBM announced earlier today new software and cloud-based services to help business leaders, such as chief marketing officers and chief human resource officers, advance their organization’s transformation with the adoption of social business technology. The new offerings will help business leaders integrate IBM’s industry-leading social networking and analytics technologies into their business processes to empower the 21st Century workforce and transform client experiences. Just as social networking has flourished in the consumer realm, Forrester has identified social business as an emerging business category, with the social technology industry growing to $6.4 billion by 2016. The new social software offerings will help companies gain deeper insights into big data generated through the use of social networks. Organizations applying analytics to their data for competitive advantage are more likely to substantially outperform their industry peers. At the same time, social media and predictive analytics have emerged as indispensable tools for CMOs, who are using technology to make the customer experience more intelligent, intuitive and individualized. According to the IBM CMO study, 82 percent of CMOs say they plan to increase their use of social media over the next three-to-five years to communicate with their clients. The IBM Employee Experience Suite will help HR leaders attract, empower and motivate talent to address skill and resource gaps while enabling their workforce to deliver better results for their clients. For example, employees can use social networking, e-meeting and instant messaging capabilities to access applications and interactive rich media such as videos, resulting in improved collaboration and greater teaming across globally distributed teams. IBM also announced that it expects to ship IBM Notes and Domino Social Edition 9 in March 2013. IBM Notes and Domino 9 will be the industry’s first truly social email client and delivers a social experience to users, whether using a browser or on the broadest range of mobile devices. IBM Notes and Domino are used by more than half of the Fortune 500. IBM mobile capabilities manage and support a variety of platforms, including Apple (iOS 6), Android, Microsoft Windows operating system, including Windows and Blackberry smartphones (including BlackBerry 10). 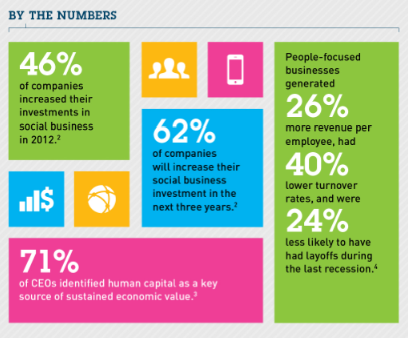 Go here for more information about IBM’s social business initiative and creating a smarter workforce. You can also follow #IBMSocialBiz and #IBMConnect on Twitter. Alister Rennie, General Manager, Social Business @ IBM, addresses how organizations everywhere can move “from liking to leading” and build “purposeful” social business strategies.